It's hard to keep track of the political gyrations at FIFA these days, especially with president and Swiss money-eel Sepp Blatter running for reelection. Corruption charges have been flying since former FA head and England's 2018 World Cup campaign chairman Lord Triesman told the British Parliament about FIFA executive committee members who allegedly wanted bribes in exchange for their votes. Russia wound up landing the 2018 World Cup. And then there was the whistleblower who told Parliament that Qatar paid FIFA executives Issa Hayatou from Cameroon and Jacques Anouma from Ivory Coast $1.5 million each for their 2022 World Cup votes. The Qatari World Cup bid committee today fired back in a letter freighted with doublespeak and fist-shaking. 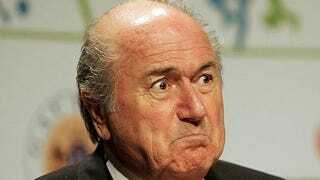 [Blatter] said someone attempted to bribe him when he was general secretary, a post he held until 1998, by putting an envelope containing cash into his jacket pocket. He declined to identify the person in an interview last week, and said the money was returned the next day. "I couldn't refuse because he put it in my pocket," Blatter said, unbuttoning the golden buttons of his navy sports jacket to reveal a pocket. "I came here to the home of FIFA and gave it to the finance director and he put this money on the account of the Swiss Bank Corp."
At FIFA, everyone seems to have an envelope in a pocket, which is how it's "allegedly" been for years with Blatter at the wheel. We're now supposed to believe that a man who wouldn't immediately refuse a cash bribe is going to clean up the mess? That's about as easy to believe as the notion that Blatter getting chummy with Alimzhan ‘Alik' Tokhtakhounov in Moscow in 2005 was innocent coincidence (after the two were introduced by a FIFA executive committee member). It's not like Blatter could have known that Tokhtakhounov had been accused of bribing judges to fix the ice skating competition at the 2002 Winter Olympics and indicted in a federal court, right?